FibroScan is the state of art technology that will improve your liver diagnosis it is accurate and reproducible assessment of liver tissue. It is a non invasive liver stiffness measurement Innovative steatosis quantification. FibroScan is used as a cutting-edge tool at the Toronto Liver Centre and provide care to patients with any form of chronic inflammation of the liver. The technology is used in the clinical management of patients with liver disease such as chronic viral hepatitis C and B, fatty liver diseases, alcoholic liver disease, hemochromatosis, cystic fibrosis, autoimmune liver diseases, and others. The first clinically validated device using transient elastography, FibroScan measures liver shear wave speed and equivalent stiffness in a quick, non-invasive and painless procedure. It is a painless alternative to liver biopsy for evaluating the stage of liver fibrosis. 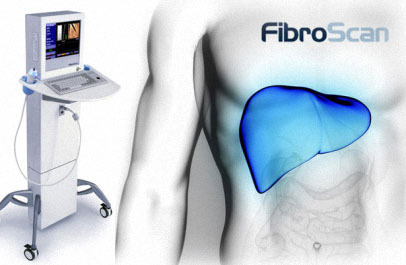 FibroScan® is used in the clinical management of patients with liver disease such as chronic viral hepatitis C and B and fatty liver diseases. Based on a technology called transient elastography, FibroScan® assesses liver shear wave speed (expressed in meter per second) and equivalent stiffness (expressed in kilopascal) at 50 Hz in a rapid, simple, non-invasive and totally painless way. Toronto Liver Centre offers a new tool called the Controlled Attenuation Parameter (CAP®), that measures the amount of fat within the liver. 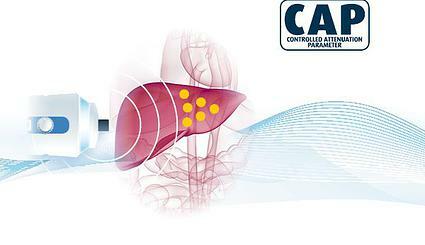 CAP® is measured at the same time as liver stiffness in the same portion of the liver. Multiple studies have confirmed the accuracy of CAP® compared with liver biopsy for both the detection of fatty liver and the quantification of fat content. Moreover, CAP® may improve following appropriate management including weight loss, improvement of diabetes and/or cholesterol control (e.g. with medications), and reduction in alcohol intake. to maintaining a normal physiology. Until recently, the touchstone test for diagnosis and quantification of hepatic parenchyma was livery biopsy, which an invasive, expensive exam that can be painful and on rare occasions cause hemorrhaging or death. instructions may vary according to the operator. The FibroScan® is typically performed as an alternative to liver biopsy. Liver biopsy is an invasive procedure that involves passing a needle through the skin into the liver to take a small piece for examination under the microscope. Due to its invasiveness, biopsy may cause complications including pain (seen in 1 in 5 patients), bleeding (1 in 1,000 patients), and/or death (1 in 10,000 patients). On the contrary, the FibroScan® is entirely non-invasive, and therefore, has no complications. Liver biopsy also requires a patient to miss a day of work whereas a FibroScan® appointment takes only 15 minutes. Lastly, biopsies sample only 1/50,000th of the liver, whereas the FibroScan® samples 1/500th of the liver (a 100-fold difference). Therefore, the FibroScan® may give more accurately assess liver health. The procedure is a less expensive alternative for identifying liver fibrosis or scar tissue. Determination of liver damage is important to help prevent complications such as liver failure and liver cancer, as well as an incentive to reverse the cause of the damage. FibroScan, VCTE, and CAP are registered trademarks of Echosens. FibroScan® only assesses liver stiffness and therefore does not replace conventional ultrasound. This is important to note because chronic liver disease patients usually require an ultrasound examination to assess the structural integrity of the liver, and to look for features of portal hypertension such as dilated portal vein, recanalisation of ligamentum teres, abdominal varices, and splenomegaly. In addition, conventional ultrasound should be performed at 6–12 monthly intervals to screen patients with cirrhosis for hepatocellular carcinoma. As transient elastography cannot perform these functions it is complementary to conventional ultrasound in the evaluation of liver disease. 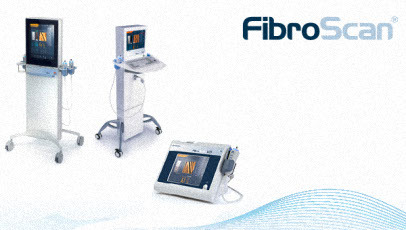 FibroScan® is much more sensitive than ultrasound for identifying less severe scarring (i.e. mild fibrosis). In other words, the greater sensitivity of the FibroScan® allows one to identify liver scarring at an earlier stage than ultrasound, and therefore start appropriate treatment before the disease is too advanced. With respect to fatty liver, the FibroScan® is also more sensitive than routine liver ultrasound and has the advantage of being able to quantify or grade the severity of fatty infiltration. FibroScan® is superior to ultrasound for the detection of liver scarring and therefore may be used to determine if cirrhosis or advanced fibrosis is present at the initial assessment and whether it has developed during follow up because of disease progression. Furthermore, recent studies have shown that the liver stiffness provides prognostic information, particularly in subjects with chronic viral hepatitis B and C, including the risk of future liver decomposition, liver cancer and survival.